Mangaluru, Feb 9,2017 : Foreign origin 24 carat gold plates weighing 698.200 grams and valued at Rs. 20,24,780/- were seized by the Officers of the Directorate of Revenue Intelligence from two persons including a Jet Airways passenger from Dubai, near the Pumpwell Circle in Mangaluru on February 8, Wednesday. 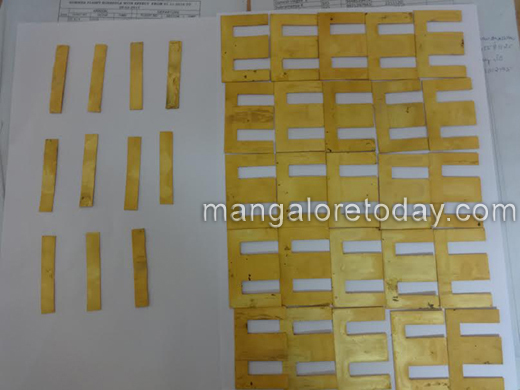 It was found that the smugglers in an attempt to avoid detection during the customs check at the Mangaluru International Airport had melted and moulded the gold into thin plates and then cut them into the shapes of letter ‘E’ and ‘I’. These ‘E’ and ‘I’ shaped gold plates were then coated with mercury and tightly packed to fit into the transformer (coil) portion of the amplifier. The arrests could be made after the DRI sleuths, who were acting on a specific information had followed a passenger who had arrived by a Jet Airways flight from Dubai and after hoodwinking the Customs scanning machines at the airport had boarded a Maruti Suzuki car and had alighted near the Pumpwell Circle where another person was waiting for him to collect the baggage from him. During the course of investigation both the accused admitted the offence committed by them. The arrested have been identified as Haris Panalam Mohammed Kunhi, the passenger and Faisal who was supposed to collect the baggage from Haris. 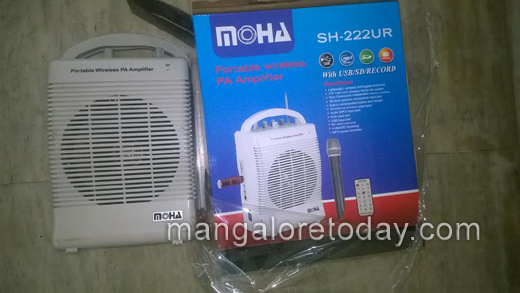 The accused Haris has confessed during interrogation that for the lure of money and free air tickets he agreed to carry the portable amplifier having gold plates concealed inside it, from Dubai to Mangaluru and after getting cleared from the airport, he had instructions to handover the item to Faisal who would be waiting near the Pumpwell circle, as per the prior arrangement. Faisal on his part admitted that he has been involved in similar smuggling operations on earlier occasions too and used to earn commission for his job of taking delivery of the smuggled gold and carrying it back to Kasargod where it would once again switch hands and through another agent reach the kingpin of the racket. 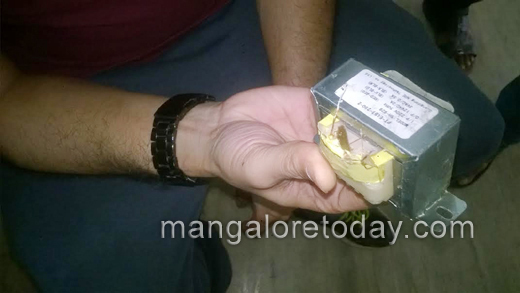 Both the persons were arrested under Section 104 of the Customs Act 1962 and produced before the Chief Judicial Magistrate, Mangaluru who remanded them to ten days of judicial custody. knowing the job is risky and not permanent still get engaged .